The idea behind “Polish Economic Eagle” is to honour companies, which through their achievements promote Poland as an innovative country and with large economic potential. The award was conferred on 15 January 2019 in Brussels. The prize was awarded to Wojciech Pawlus, Managing Director for the Benelux Region, by Artur Orzechowski, Poland’s Ambassador to Belgium. The Comarch Group continues its strong development all over the world. Belgium and also other countries of the Benelux Region remain one of the strategic markets for the company. Comarch has been operating in the Benelux countries since 2006, with its offices located in Brussels, Luxembourg, and a newly-opened branch in Rotterdam. Comarch’s business activities are concentrated in the region on the promotion of its IT systems to different verticals as retail, telecommunications, banking, insurance and manufacturing. In recent years, Benelux has turned out to be a dark horse in the group’s structures and has become the third largest market for Comarch, after Poland and Germany. In 2018, sales of Comarch software in the Benelux countries exceeded PLN 100m. 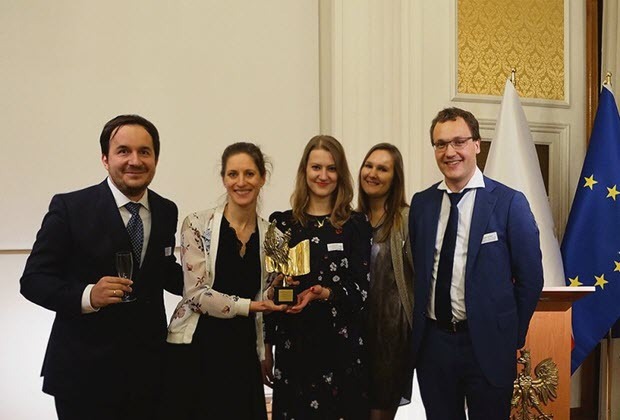 “The Polish Economic Eagle award is a particular distinction for Comarch in Belgium. We are proud that our company is perceived here as a recognized IT challenger. 2018 was another record year for Comarch in Benelux: we won new strategic customers from banking, insurance, oil & gas, chemical, manufacturing as well as telecom industries. We also notice further opportunities in the region; that’s why we are planing to expand our business activities in the new areas as E-health and Internet-of-Things.”, says Wojciech Pawluś, Managing Director for the Benelux Region. The company commenced its business activities in the region from the sales of IT systems for telecom (KPN, Orange, or Medialaan) and financial industries (ING, AXA, and Delta Lloyd Life). In the recent years, Comarch has also expanded in Benelux its offer on loyalty management and e-invoicing solutions. The list of regional companies using innovative products provided by Comarch includes important brands as ERGO, Telenet, Brussels Airlines, or Hudson’s Bay to name a few. The company is also very active in Luxembourg with top customers as Swiss Life, AXA, SGG, or Orange Luxembourg. In Benelux, Comarch comprises a business team of sales and marketing professionals, consultants as well as project managers and analysts that specialize in IT systems offered to telecom, finance, retail and manufacturing. Among others, Comarch promotes here its flagship products for bss/oss, loyalty, e-invoicing, wealth management, digital insurance, corporate banking as well as its outsourcing, IT infrastructure, and Data Centre services.